VW’s first sports car or was it the first Porsche? STOP PRESS! (2 March ’12) Both the car featured below and one of the first VW Beetles built (in 1938) will be displayed for the first (and probably only) time in the UK at the VolksWorldShow at Sandown Park in Esher, Surrey on 24 and 25 March 2012. So, all you ‘aircooled’ fans out there know where to be that weekend! Jack’s first entry of the New Year (2012) is this item about the stunning 1939 Kdf-Wagen Type 60 K10 Rekordwagen, the so-called Berlin-Rome coupé, which recently won the ‘Car of the Year’ at the International Historic Motoring Awards. This car has been meticulously restored from bits acquired from race driver Otto Mathé by the Prototype Museum in Hamburg. 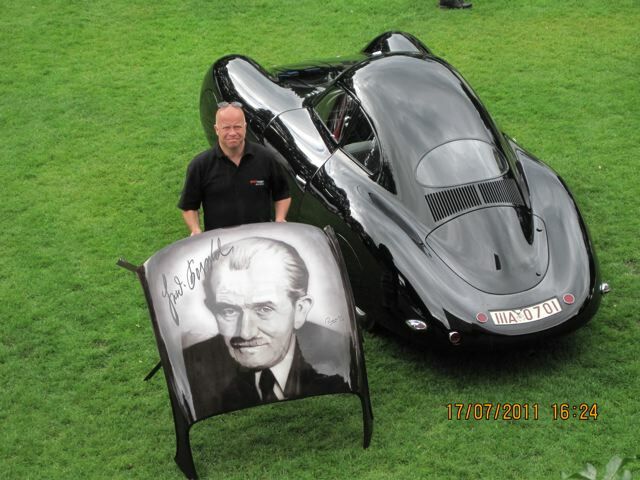 The man in the picture with the painting of Ferdinand Porsche on a (Porsche) 356 roof is the artist. My good friend, Fred Ferrier, took the photograph. This car represents Dr Porsche’s first efforts to develop a sports version of the Volkswagen Beetle, the car then being developed for the masses. You might say it was really a very early Porsche, as the good Doctor went on to design and produce his own cars in 1948 in an Austrian saw mill. The rest is history, as they say. Incidentally, the car is featured in the February 2012 issue of ‘Volks World’.